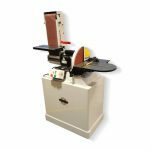 A combination belt-disc sander is similar to a mid-round draft choice on an athletic team. 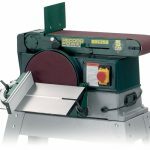 It’s not a priority purchase, like a table saw or planer, but it’s valuable in a woodworking shop as a role player. It’s two tools in one. The disc is great for precise edge work, like fitting mitre joints and truing outside curves. The belt allows you to flatten faces and edges, shape contours and smooth inside curves. All these sanders are equipped with 6-in. x 48-in. belts and 9- to 12-in.-dia. discs. These are not industrial-quality machines (see “Consider These Alternatives,” ), but they’re a good fit in small pro or home shops where they won’t be used constantly. The sanders in our test fall into two categories (Figs. A and B). Machines priced under $300 have limitations in capacity, power and ease of operation compared with those that cost more. Still, the fact is some of these lightweights deliver good value. Effective dust collection is a top priority, because combination sanders spew clouds of fine dust. Blast gates concentrate the suction to the tool being used. Combination sanders and your fingers don’t mix. Both disc and belt operate simultaneously, even though you only work on one of them at a time. Unintentional contact with the abrasive can be painful. Belt and disc shrouds minimise your exposure. The best belt shrouds cover the bottom, back and top of the belt. Many machines leave the top and back uncovered, which is especially dangerous if the belt is positioned vertically. For durability, we prefer metal shrouds. Sanders that come with covers that shield the front of the disc when you’re working on the belt. Every machine should have them—and similar covers for the belt. Full shrouds protect against accidental contact with the abrasive—and instant regret. A removable top allows you to sand inside curves on the roller. Direct-drive systems transmit power efficiently and reduce vibration by eliminating pulleys and belts. Instead, the belt and disc mount directly to the motor’s driveshaft. The disc or belt shouldn’t slow significantly during use. Horsepower and amperage ratings don’t tell the whole story, because they don’t indicate how effectively the power is transferred. Belts can slip and pulleys can be out of alignment. Both conditions eat power. In our tests, sanders with direct drive were less likely to slow down than belt-driven models with motors of similar size (see photo, above right). The downside of direct-drive sanders is that the dedicated motor may be both expensive and difficult to replace. We were able to find “sweet-spot” speeds for both belt and disc sanding on the variable speed sanders, which are belt driven. Speed, abrasive choice and feed rate are all related. For safety, and for fast results without clogging the abrasive or burning the wood, we prefer the combination of coarse abrasive (60 grit), slow speed and a light touch. Sanders with variable speed control allow you to dial in exactly the speed you want. Sanders with 9-in. discs rotating above 3,000 rpm (the case with several light-duty sanders) are scary-fast. Sanding with one of these speed demons requires an experienced operator. All the 12-in. discs rotate at about 1,720 rpm, which we found to be effective and user-friendly. Belt speeds under 1,500 feet-per-minute (fpm) are too darn slow. We prefer tables mounted on trunnions (left) or pivot arms (centre) because they lock securely. Cast trunnions (typically found on industrial sanders) are the traditional choice, but stamped steel pivot arms are just as effective. Long levers are best for locking the table securely. Tables mounted on a single post (left) are much less effective. They can work loose and allow the table to rotate. We recommend sanders with separate tables for the disc and belt. Light-duty sanders often have only one table that serves both. These dual-service tables mount on a post, which is only held in place by setscrews. No matter how tightly you reef on the setscrews, typical back-and-forth sanding action can cause the table to work loose. Most medium-duty sanders have dedicated tables mounted on trunnions or pivot arms (see photos, above). Trunnions are cast iron or aluminium alloy. Stamped steel pivot arms depend on a perfect fit at the pivot pin. Usually the pin is threaded, so you can tighten it. Cast-iron tables are best because they dampen vibration. Large tables provide better support. Most of the sanders we tested come with mitre gauges that are merely adequate. Tables with standard-size mitre slots make it easy to upgrade to a better-quality mitre gauge. A 12-in.-dia. disc has 6 in. of usable width, because only the portion that rotates toward the table can be used safely. You lose 1-1/2 in. of usable width with a 9-in. disc. Because of its rotation, you can only use half of the disc safely. Sanding on the half that rotates away from the table is dangerous—be sure to use only the half that rotates down toward the table. Opting for a bigger disc seems like a no-brainier. A 12-in. 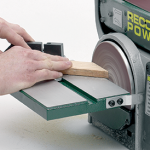 disc allows sanding widths up to 6 in., so you can true up mitres on pieces as wide as 4 in. A 9-in. disc maxes out at 4-1/2-in. widths and can only handle mitres on 3-in.-wide stock. Almost all of the discs in this test are made of aluminium (industrial sanders have discs made of machined steel or cast iron). While the 9-in. aluminium discs were similar from sander to sander, we found significant variations in the 12-in. discs. The heaviest 12-in. discs weighed 25 percent more than the lightest and had almost twice the wall thickness. For precision work like truing up mitres, the disc must be rigid. Deflection wasn’t an issue on the sanders we tested with 9-in. discs, but it was on some sanders with 12-in. discs. We found that the most rigid 12-in. discs were mounted on sanders that had large-diameter drive shafts—at least 3/4 in. (19mm). Disc abrasive changes are easiest if the lower shroud gives you room. On many sanders, you have to remove a cover that’s screwed to the shroud. All 12-in. discs aren’t created equal. Better ones are thicker, reinforced and balanced, and they have a larger bore. Choosing the “right” belts and discs isn’t a life or death decision, because they aren’t very expensive. Top-quality belts cost less than $10 and discs less than $5. Economy abrasives cost about half as much. Here are some guidelines for good sanding service. 1. A coarse, “open-coat” abrasive (60 to 80 grit) is the best choice for most general-purpose sanding. It cuts aggressively, so you can sand with a light touch, which is easier on the sander and safer for you. 2. Sanding belts with a heavy backing material (X- or Y-weight fabric) stay cooler and hold their shape better during use. 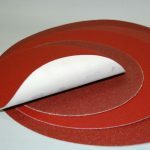 Unlike belts, sanding discs are firmly attached to a solid surface, so lighter-weight backings are fine for them. 3. Aluminium oxide or zirconium oxide abrasives are the best choices for sanding wood. Silicon carbide is best for sanding metal. 4. An anti static coating on the belt or disc removes static charges created by sanding. Did you ever notice how sanding dust sticks to everything? That’s because sanded particles are statically charged. Using belts and discs with an anti static coating can leave you with a cleaner shop: Non charged sanded particles remain suspended, so they’re more easily captured by your dust collector. Don’t use anti static belts or discs without dust collection—the particles will just hang in the air. A cleaning stick extends the life of any belt or disc. Used frequently, it’s the best abrasive-related investment you can make. The belt arm pivots to allow sanding at any angle. A split collar makes position changes easy because it locks at a single point .Your other choice is a slotted dual-ring mechanism that locks with two or three bolts, which are often hard to reach. Adjusting the belt arm should be simple. A split collar lock mechanism is best. Gaining access for belt changes shouldn’t be too complex. Some sanders require more than one tool and leave you with numerous loose parts. Changing abrasive belts takes multiple steps, and getting hung up on any one of them makes the job a chore, especially if you change belts often. 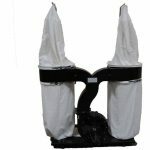 First you have to get to the belt, which requires removing the dust collection and belt shrouds. On many sanders, this is a tedious operation, but it should be simple, tool-free and fast To change belts, you have to release the belt tension. It’s easy if the sander is equipped with automatic belt tension and a pain if it isn’t. After the new belt is installed, you have to adjust the tracking to make sure it stays centred on the platen during operation. Automatic tension mechanisms use spring pressure to compensate for minute differences in length between belts. They also keep belts properly tensioned as they stretch during use. Most of the sanders we tested use one of two types. Mechanisms designed around a post-mounted yoke are most user-friendly. Contour sanding using the top roller isn’t possible with side-mounted mechanisms, because only one end of the roller is supported. Automatic tensioning makes belt changes easy. We prefer mechanisms with a yoke that supports both ends of the roller and an on-off lever to set and remove the tension (see photo, far left above). Belt tracking adjustments are simple because they’re made with a single knob. Side-mounted mechanisms are harder to use, because they’re spring-loaded (see photo, left). You have to hold the lever down with one hand while removing or installing the belt with the other. Belt tracking adjustments require two knobs. A stop arm makes sanding easier and safer, because it keeps the belt from ripping the work piece out of your hands. Its location should allow full-length use of the belt platen. A cast-iron belt platen isn’t necessarily better or flatter than one made of stamped steel. The least-expensive machines we tested have cast-iron platens; some of the more expensive machines employ stamped steel. We didn’t notice significant differences between them during our test, but we did find an easy way to flatten platens made of both materials. A perfectly flat platen isn’t absolutely necessary, because the belt isn’t intended for precision work. However, sanders ran more smoothly and quietly after their platens were flattened, reward enough for the 10 minutes we spent doing the job and the belt that we sacrificed. First, joint the face of a 3- to 4-in.-wide board that’s long enough to bridge the platen’s entire length. Disconnect the dust collection hose. Turn a clean used belt inside out and install it abrasive-side down. Start the sander, position the flattening board on the platen and bear down lightly as you move it back and forth. Don’t bear down hard enough to stop the belt, or you’ll score the rollers. Stop and check the results frequently.